Fig. 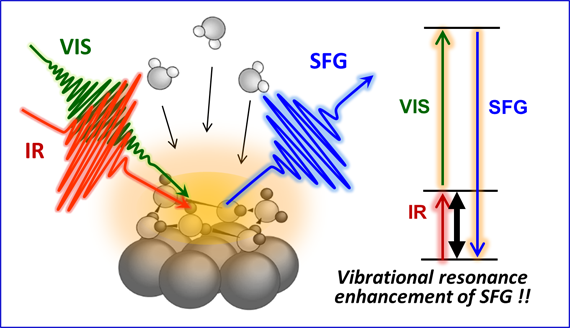 1 Infrared-visible sum-frequency-generation (SFG) spectroscopy of water molecules on solid surface 3). Fig. 2 Unimolecular inelastic-electron-tunneling (IET) spectroscopy of quantum rotator on solid surface 2). 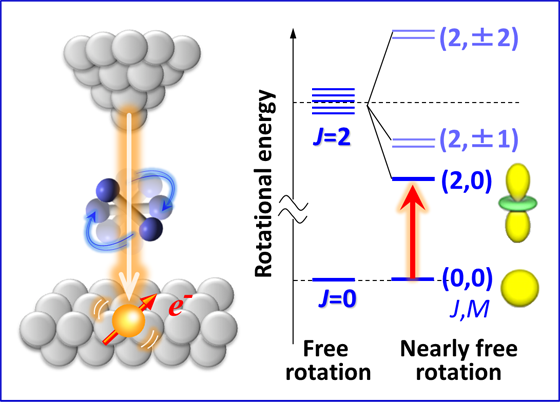 T. Sugimoto et al., Inelastic Electron Tunneling Mediated by Molecular Quantum Rotator, Phys. Rev. B 96, 241409(R) (2017). T. Sugimoto et al., Emergent high-Tc ferroelectric ordering of strongly correlated and frustrated protons in heteroepitaxial ice film, Nature Physics 12, 1063 (2016). K. Shirai, T. Sugimoto et al., Effect of Water Adsorption on Carrier Trapping Dynamics at the Surface of Anatase TiO2 Nanoparticles. Nano Lett. 16, 1323 (2016). T. Sugimoto et al., Nuclear Spin Dynamics of Molecular Hydrogen Adsorbed on Solid Surfaces –Interdisciplinary Surface Electromagnetic Process-. J. Phys. Soc. Jpn. 71, 668 (2016).